Indian jewellery industry is dominated by the unorganized sectors, employing around two million people and contributing over 15% of the country's total exports. Goldsmiths usually specialize in gold curing, rolling, wire making, sorting, setting, assembling, embossing, engraving and polishing gold. Jewellers need a high degree of skill, precision, and attention to detail, similar to those engaged in electronics manufacturing and in watch repairing. , Job-related vision standards benefit both the employee and the employer. , To obtain the maximum efficiency of the worker without any strain, it will be advisable to set visual standards. To the best of the authors' knowledge, there was no such vision standard available applicable for the jewellery profession. Hence, this study was done to evolve vision standards specific to the people who are involved in jewellery making in India. Visual Task Analysis (VTA) of Goldsmiths: A detailed description of each of their tasks were recorded using the visual task analysis guide (Appendix I) proposed by Grundy JW. 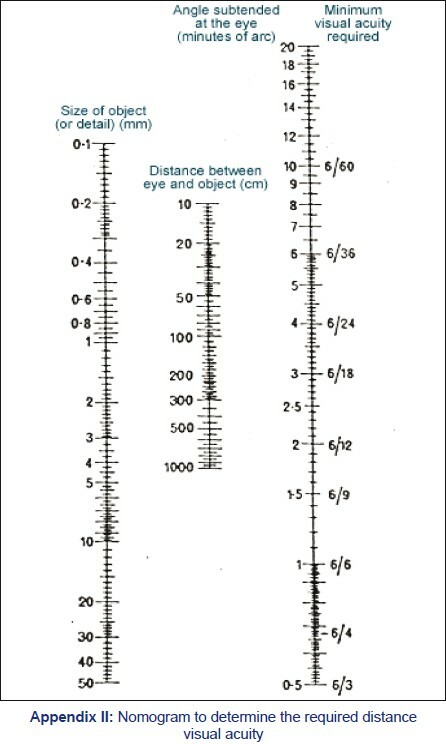 The minimum visual acuity required to perform the specific job was determined using the size of the critical detail and the working distances involved in performing the task using the nomogram (Appendix II) and the required near visual acuity was found using the conversion Table (Appendix III). Based on the observations, requirements of other visual functions were also determined. Criteria for Visual Competency: Depending on the importance of certain visual functions to perform the job, criteria for visual competency was laid down. The visual functions were sub-divided into two categories, namely category (a) and (b), where (a) included all the functions required to perform a near task, namely, Best Corrected Visual Acuity (BCVA) for near (N4.5 or better), accommodative amplitudes ≥ Hofstetter's average age appropriate amplitude, presence of orthophoria for near, near point of convergence (≤ 6 cms) and stereopsis (40 arc seconds). Category (b) included visual functions like BCVA for distance (6/12 or better), presence of orthophoria for distance, good contrast sensitivity for edge detection and presence of normal colour vision. Category (a) was considered twice more important than (b). Therefore, when each and every one of the visual function in category (a) and (b) were satisfied, a score of two and one was given respectively. Either failure to satisfy one visual function in category (a) or more than one visual function in category (b) was considered as visual incompetency. Visual abilities of goldsmiths: Visual acuity for distance (LogMAR chart) and near, stereo acuity for near (Titmus Fly Test), contrast sensitivity for edge detection (Melbourne Edge Test), colour vision (Ishihara Test Plates), binocular vision assessments - cover test, near point of convergence and accommodative amplitudes, presence of refractive error and ocular health were assessed at their work place, in order to determine their visual capability. Grading the job competency: Job competencies of goldsmiths were graded by their supervisors on a 10 point scale, where 1 denoted the lowest and 10 denoted the highest competency level. The grading was based on the quality and quantity of production. Visual competency Vs Job competency: The grading of the job competency and visual competency was compared so as to see if those subjects who did not meet the visual competency criteria fell under job incompetent group and vice versa. Visual task analysis: VTA was done at different workstations (n=91), which involve the tasks namely, gold curing, rolling of gold, jewel sorting, jewel assembling, jewel setting, wire making, jewellery embossing, jewellery engraving, gold filing, ball making and gold enamelling and gem setting. The median working distance was 23 (Inter Quartile Range (IQR) 20-29) cm. The size of the critical visual detail ranged from 0.3 to 3 mm with a median of 0.5 mm. The median working area was 514.5 (IQR 183-746.5) sq cm. Direction of gaze while at work of 96.7% of the population was downward, 2.2% straight gaze and 1.1% with the combination of up and down gazes while 56% had side to side head movements. The frequency at which the gaze direction had been changed was found to be low among 98.9% of the population. The median illumination used at their workplace was 358.5 (IQR 170-536.5) lux; 30.8% of the workstations had <200 lux of illumination and only 3.3% of the workstations had >1000 lux. Fluorescent lighting was used by majority and very few (n=2) used incandescent light source. The frequency and percentage of the type of lighting used at the workplace is in [Table 1]. The tasks to be performed were stationery and did not involve any moving objects in any of the job types. Majority (84%) of the population's working posture was sitting position on the floor and working on a short Table and 2% were found to sit on a stool and work on machines. Workplace hazards: Those working in the melting process, soldering and polishing of gold were exposed to nitric acid, sulphuric acid, cadmium, boric acid, and cyanide. Those working in machine cutting area were prone to foreign body injuries due to flying gold particles. Vapours from liquid petroleum gas, improper positioning and inappropriate use of light sources were observed to be sources of discomfort among the workers. 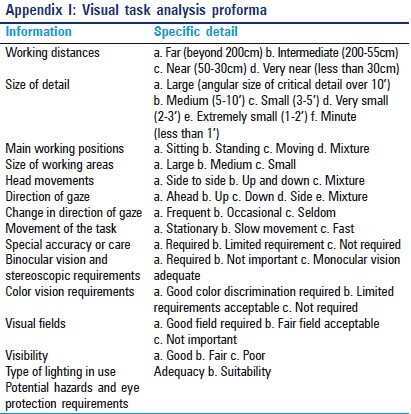 Visual Demands (Visual function requirements): The near and distance visual acuity requirement to perform the job for various work types are shown in [Table 2]. An average of 58 degrees of horizontal and 43 degrees of vertical visual field were found to be required for all the work types. Requirement of colour vision was only limited to those whose works involved identification/ matching of colours as in enamelling or gem setting. Special accuracy and care were required at all the stages, but was found to be specifically important in setting and assembling the jewel. The motor components of vision, like near point of convergence, phoria status and accommodative amplitudes were found to be important in all job types as they were involved in working at closer distance for prolonged hours. Visual abilities: Almost 60% of the population had at least one visual (31%) or ocular (24.9%) symptom. The frequency and percentage of the symptoms reported are given in [Table 3]. 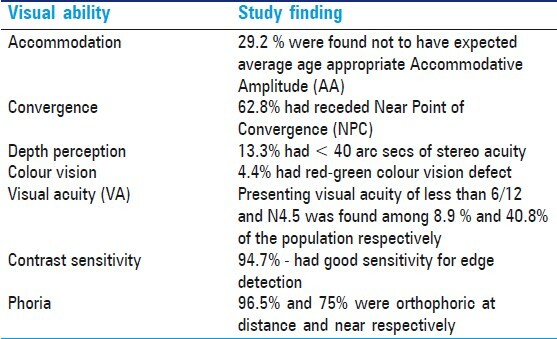 The summary of study findings on various visual abilities of Goldsmiths is given in [Table 4]. Based on their visual capabilities (i.e., the ability to satisfy the criteria which has been laid earlier), 44.7% were found to be visually competent and 55.3% to be visually incompetent. Job Competency: 30 goldsmiths were graded by their supervisors for their competency in job on a 10 point scale. The grading ranged from 7 to 10. They were divided into two groups namely, job competent (40% - those having grade of 8.5 and below) and highly job competent (60% - those having grade of 9 and above). Job competency Vs Visual competency: The relationship between the job competency and visual competency of 30 subjects is represented in [Table 5]. There was no significant association (P value = 0.645) found between the two groups of job and visual competency using Chi-square test. This is the first such study to the best of our knowledge, dealing with establishing vision standards for goldsmiths in India. Visual demands: Jewellery makers, watch repairers and electronic manufacturers are classified as engaged in occupations having similar visual demands. 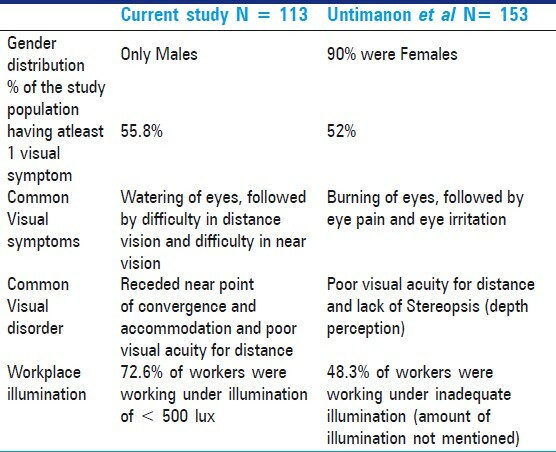 Our study has shown that the minimum distance visual acuity required for efficient working as 6/12 and the expected near visual acuity for habitual working distance (23cm) to be N4, age appropriate accommodative amplitude requirement along with the other qualifying visual factors mentioned in previous literatures like convergence at closer distance, depth perception and colour discrimination in certain areas of work. While comparing the visual demands placed by this job with that of watch repairers, it was found that Goldsmiths had higher visual acuity demand i.e. 6/12, N4 as compared to 6/60, N15. Rest of the qualifying visual factors were found to be similar except for the requirement of colour vision in a few areas of jewellery making process. Though certain job types were found to create lesser visual demand than others, the higher demand of visual acuity has to be considered at pre-placement while a combination of works like rolling, sorting, assembling, setting and wire making is to be carried out by a single person. 4.4% (n=5) of the study population were found to have defective colour vision, but none of them were working in places where colour vision was a major requirement. Visual field was not found to be a major visual requirement as their area of work was confined. Our study population consisted of only male subjects. There were only few subjects (5.4%) in the age group of > 45 years, suggesting that there is a general tendency among the jewellery makers to leave the work during their mid thirties and forties, which is way too early for a person's work life. Generally visual capacity deteriorates with age of the worker. Visual acuity for example tends to deteriorate starting from mid thirties. Visual acuity is said to be significantly influenced by task size, contrast and viewer's visual performance, which is the ability of the eye to carry out the visual task with both speed and accuracy. Visual performance has been shown to be significantly influenced by the quantity and quality of lighting present at the work place. The deterioration in visual functions makes it necessary to find ways to enhance it by providing appropriate correction and by improving their visual environment by means of good lighting. This emphasizes the need for vision care services which would allow workers to meet the minimum levels of standards. Since the presence of required distance visual acuity is not so prudent to perform the task, a low myope with a far point, which falls well within the required working distance range, can be considered for recruitment. Same holds for a hyperope having adequate accommodative reserve. Discomfort was reported with the use of incandescent light. Since incandescent light produces lot of heat, it becomes an inappropriate choice for use as on the task lighting. Fluorescent lamps have the requirements of ideal light source such as good colour rendering property, higher luminous efficacy and longer lamp life. They have a disadvantage of flicker production as the lamps age. Since our job of interest does not involve any moving object, this light source can be considered as an ideal one. Therefore, it is necessary to provide appropriate and adequate lighting by increasing the level of general illumination and further adding localized illumination to it. Working area, working position, direction and frequency of eye and head movement while at work was found to be interrelated. This study shows that those who worked on desk had relatively lesser working area, more frequent movement of eyes and not much of head movements while compared to those using machines, where frequent change in direction of gaze was involved. For working at a machine, a head turner can get along with a relatively narrow segment progressive lens, whereas a wide segment is essential for an eye mover working at desk. These factors need to be taken into consideration while evaluating a person at pre-employment stage. For example, if a person is to be placed for working with machines, where more of head movement is involved, it has to be seen that the person is wearing the appropriate type of glasses, for in this case either a narrow segment in a bifocal or narrow corridor width in a progressive addition lens would be essential. Job competency Vs visual competency: The current study reported no significant association between the two groups of job and visual competency. Inspite of many people being visually incompetent, their job competency status did not project the same. Non-existence of proper job competency standards for the occupation. As the occupation is dominated by unorganised sectors, where standardization of job functions and setting up criterion are difficult, the possibility of obtaining a job competency standard is a challenging task. Another reason being non-automated, handmade process of manufacturing, where each design has its own unique style which cannot be time, quality or quantity rated. Grading of job competency was obtained from supervisors of only two workstations. Non-availability of supervisors in certain places is the reason behind the inability to obtain the grades for others. Even in the small organised sectors, there was no proper system to design or document job competency, leading to recall bias of the supervisor. Absence of significant association between job and visual competency does not conclude that the vision standards thus obtained are inappropriate. Vision is one of the factors necessary in the make-up of the skilled worker. It has been shown that job performance can often be predicted, to some extent, on the basis of visual skills  High intelligence and experience often counterbalance the handicaps which arise from poor visual acuity. Such people should not be turned away from their jobs. For the selection of right man for each job, along with the mental and physical make-up of the individual, the required visual abilities should be the guide. Since the visual demands remain the same, whoever is going to be employed for the job, the findings of the study can be considered as a requirement at pre-employment stage for efficient working. The study also emphasizes the need for periodic vision examination of the worker, as the minimum vision requirements of the job can be met with appropriate intervention. In conclusion, this study shows best corrected visual acuity of 6/12, N4, binocular visual field of horizontally 53 degrees and vertically 43 degrees, physiological phoria, 40 arc secs of stereopsis for near, near point of convergence of 6 cms or less, average Hofstetter amplitude of accommodation and normal color vision to be the expected pre-employment vision standard for the goldsmith. Mr. M. Shankar, Adjunct Faculty, Technical communication, Elite School of Optometry, for reviewing the manuscript. 1. Available from: http://www.india-exports.com/jewellery.html. [Last Accessed on 2011 May 5]. 2. National Classification of Occupations, Craft and Related Trade workers, Division 7 (7313 Jewellery and Precious Metal workers) Available from: http://dget.nic.in/nco/jobdescription/Des-Div-7.pdf. [Last Accessed on 2010 Aug 20]. 3. Untimanon O, Pacharatrakul W, Boonmeepong K, Thammagarun L, Laemun N, Taptagaporn S, et al. Visual problems among electronic and jewelry workers in Thailand. J Occup Health 2006;48:407-12. 4. Ramani KK, Ganesan N, Santanam PP, Ramaswamy I. Visual task Analysis of Watch Repairers. Optom Today 2009;35:139-43. 5. Good GW, Weaver JL, Augsburger AR. Determination and Application of Vision Standards in Industry. Am J Ind Med 1996;30:633-40. 6. North RV. Work and the eye. 2 nd ed. Butterworth - Heinemann, Oxford 2001. p. 1-30, 74-83, 93-116. 7. Grundy JW. A diagrammatic approach to occupational optometry and illumination. Optom Today 1987;1:503-8. 8. Holmes C. Guide to Occupational and Other Visual Needs. Vol. 1. Silverlake Lithographers Inc, California.1958. p. 10-3, 96-97. 9. Scheiman M, Wick B. Clinical Management of Binocular Vision: Heterophoric, accommodative and eye movement disorders. 3 rd ed. Philadelphia: Lippincott Williams and Wilkins; 2008. p. 347-80. 10. Lee SY, Koo NK. Change of stereo acuity with aging in normal eyes. Korean J Ophthalmol 2005;19:136-9. 11. Scheiman M, Mitchell GL, Cotter S, Kulp MT, Cooper J, Rouse M, et al. A Randomized Clinical Trail of vision therapy / orthoptics versus pencil pushups for the treatment of Convergence Insufficiency in young adult. Optom Vis Sci 2005;82:583-95. 12. Birnbaum M, Soden R, Cohen A. Efficacy of vision therapy for convergence insufficiency in an adult male population. J Am Optom Assoc 1999;70:225-32. 13. Stellman JM. Encyclopedia of occupational health and safety. 4 th ed, Vol. 2. International Labour Office, Geneva 1998. p. 46. 2-18. 14. Kaufman JE. IES Lighting handbook, Application Volume, Illuminating Engineering Society of North America, New York 1981. p. 2. 5-12. 15. American National Standards Institute (ANSI) RP-7-01, Recommended Practice for Lighting Industrial Facilities. Available from: http://webstore.ansi.org/RecordDetail.aspx?sku=ANSI%2FIESNA+RP-7-01 [Last Accessed on 2011 May 3]. 16. Occupational Safety and Health Standards - Toxic and Hazardous Substances. Available from: http://www.osha.gov/pls/oshaweb/owadisp.show_document?p_table=standardsandp_id=9992 [Last accessed on 2011 May 3]. 17. Anshel J. Visual Ergonomics Handbook. Taylor and Francis Group, 1 st ed. 2005. P. 91-118.